Emmanuel Baptist Church in Albany, NY has been a client of Foresight Architects for over twenty years. During that period of time, they have done an amazing job of restoring their beautiful High Victorian Gothic Revival church built in 1871. 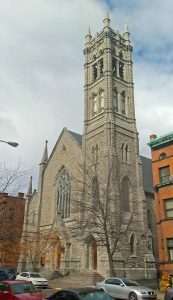 Much of the work has been accomplished through grants – most notably the Sacred Sites Program of the New York Landmarks Conservancy. Now churches in other states will have similar opportunities. A new partnership between Partners for Sacred Places and the National Trust for Historic Preservation will provide up to $10 million in capital and development grants to 50 congregations of diverse faiths over the next four years. After their initial selection, congregations receive special planning grants, customized consulting services from Partners staff, and additional training. While the 14 congregations for 2016-2017 have already been selected, applications are now being accepted for the next round of funding. Matching capital grants that range from $50,000 – $250,000 are being made available. Continue reading to see if your church is eligible. The property must be located within the United States or its territories. The property must have been originally built to be a house of worship, and owned by an active community of faith. The property must have architectural, cultural or historic value that is of regional or national significance, and be listed on or eligible for the National Register of Historic Places. Special emphasis will be placed on sites that have had a prominent physical and/or historical place in the community. The property must be occupied by a congregation that is community minded and has a demonstrated interest in providing outreach ministries that benefit both members and nonmembers. Special emphasis will be placed on congregations that share space and partner with other nonprofit organizations, and plan to make the most of their building as an asset for community renewal and service. The property must have urgent repair needs including structural components, walls, roof, and/or other elements of the building envelope or mechanical systems that are integral to life safety. Projects that improve the usability or ADA accessibility of the property are also eligible. Also, renovation projects that make vacant or underused space usable for important community outreach are eligible. Anticipated projects must respect the historic character and materials of the building(s), and adhere to the Secretary of the Interior’s Standards for Rehabilitation. Projects must be able to raise matching funds at a 1:1 rate for grants of $50,000 to $99,999. Grants from $100,000 to $250,000 require matching funds of 2:1. The applicant must prove that is it not able to raise the total cost of the project from congregational membership/regular donor base alone. Grant funds are intended to support projects that are not yet completed. Therefore, reimbursements cannot be issued for any payments made prior to the date of the executed grant agreement. The applicant must be a religious congregation or closely affiliated nonprofit organization. The applicant must have been in existence for a minimum of three years prior to the date of application. Please note that the applicant is not required to have developed a repair plan, budget, timetable, or fundraising plan prior to application. However, if you would like assistance in assessing your capital needs for repairs or improved accessibility, please contact us. We would be happy to assist you with a Conditions Assessment or Master Plan.